dFor anyone who may not know, a blondie is the white chocolate version of a brownie- a flat, baked square or bar. The nice people at Tequila Rose sent me a bottle of their delicious tequila based strawberry cream liqueur to create a recipe with. 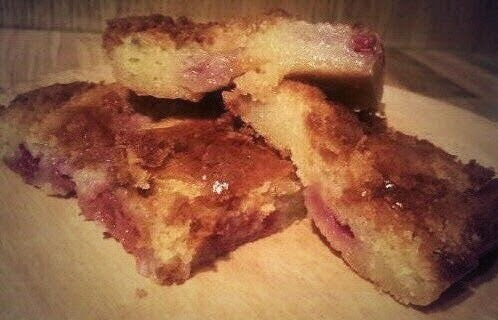 Here are my delicious blondies, they aren't healthy but taste amazing! Put butter and chocolate into a medium bowl. Fill a small saucepan about a quarter full with hot water, then sit the bowl on top so it rests on the rim of the pan, not touching the water. Put over a low heat until the butter and chocolate have melted, stirring occasionally to mix them. Remove the bowl from the pan. Break 3 large eggs into a separate large bowl and tip in 275g golden caster sugar. Whisk the eggs and sugar until they look thick and creamy, like a milk shake. Hold the sieve over the bowl of eggy chocolate mixture and sift the flour mixture into it and fold in again. Add the Tequila Rose and Strawberries and gently mix in. Pour the mixture into the prepared tin, scraping every bit out of the bowl with the spatula. Gently ease the mixture into the corners of the tin and paddle the spatula from side to side across the top to level it and make sure the raspberries are spread evenly. Put in the oven and set your timer for 20 minutes. When the buzzer goes, open the oven, pull the shelf out a bit and gently shake the tin. If the brownie wobbles in the middle, it’s not quite done, so slide it back in and bake for another 5 minutes until the top has a shiny, papery crust and the sides are just beginning to come away from the tin. Take out of the oven. Leave the whole thing in the tin until completely cold then cut into squares and serve!